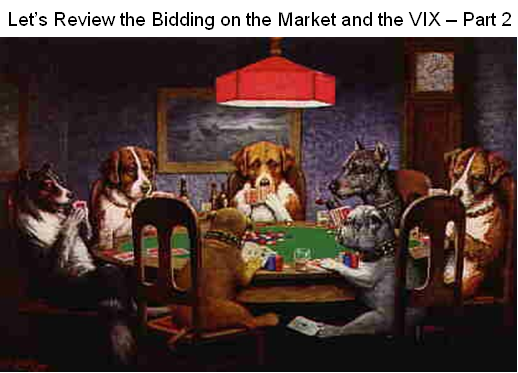 “Meanwhile, back at the ranch, the VIX has laid dormant for all of 20 trading days and for the first time poked its %B head above the Bandwidth today…a sign that could lead to the Bear’s dancing once again. 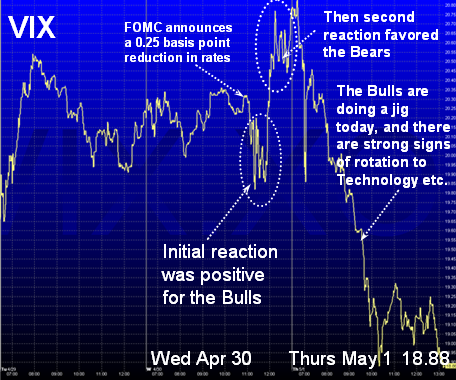 What will it take for the VIX Bear followers to do cartwheels that their patience has been rewarded? My crystal ball says an immediate bounce of the VIX from 20.24 to 21.56 will do the trick and that too will depend on what the Fed has to say tomorrow. Otherwise anything below a reading of 20.00 will suggest more ambling sideways with a dormant VIX, and there may be hope for the Bulls to continue upwards. I won’t prolong the suspense, but the confluence of forces has been resolved in the Bull’s favor, and the VIX handed them icing on the cake today with a Little Kahuna of a -0.29 move to the downside in the %B to take it down to 18.88! That is manna from heaven for the Bulls, and suggests the Rally should continue for a while longer. Some might think that this low volatility implies complacency, but beauty is in the eye of the beholder. Recall in earlier charts I showed that the VIX was around 12ish before it took off into the sunset on four bouts of extreme volatility to over 30, but it is still a long way off where it needs to go for this to be a full blown bona-fide Bull Rally that pulls the Market out of the doldrums of the Bear Market it has been in for all of 6 months now. The more important point is that the Bulls have “Breathing Room” for now, so enjoy it. However, do NOT count your chickens before they are hatched as tomorrow brings the Employment numbers and these days the Market moves on the latest news, i.e. yesterday’s news will be stale by then! This was a big day for the bulls with a strong push through the 2440 barrier on the Nasdaq. The big winners in the leading stocks came from the Technology and Machine – General arenas to name a couple, including a few Chinese Silverbacks, e.g. JRJC, SOHU, PWRD, NPO, GRC, MPWR, ANSS, and SNHY as examples. Water Pumps are big right now! On the other hand, many of the favorite Chemical – Specialty stocks are trying to find bounces and support off their 17-dma, 50-dma or 200-dma. The jury is still out as to whether there is rotation out of this group; or whether this is normal corrective action in a group that has had a long strong rally, is fat with profits, and with the glowing Earnings Reports, they are suffering from the accompanied usual Analyst downgrades at such times. Stocks such as POT, MOS, CF, TNH and TRA in this group need careful watching. Let’s see what tomorrow brings and then Ron will have a full review in his Weekly Movie and I will chime in if I see some clear direction. I hope I have led you through the tulips and the minefields with the factors that influence decisions around Earnings Reports and Rotation vs Correction concerns. This entry was posted on Thursday, May 1st, 2008 at 6:39 pm	and is filed under HGS Principles, Market Analysis. You can follow any responses to this entry through the RSS 2.0 feed. Both comments and pings are currently closed.